The Ford F series was the best-selling vehicle in Canada in January. Trucks now have 75 per cent of the market share, according to the Global Automakers of Canada. 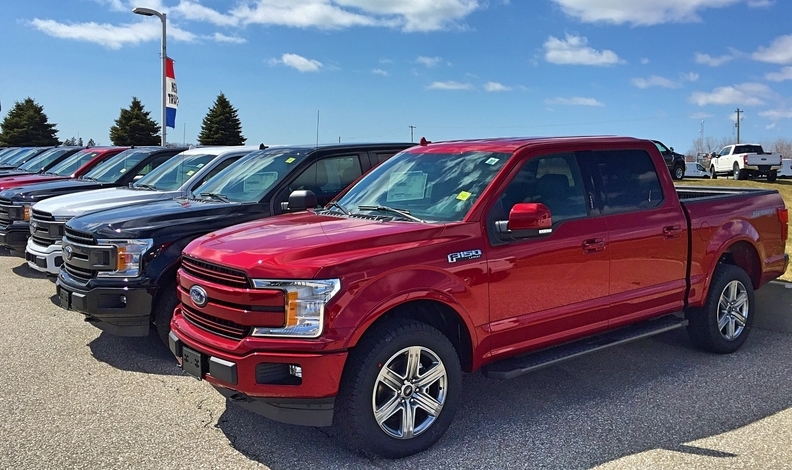 New-vehicle sales in January fell 5.4 per cent to 111,225 units sold when compared with the same month last year, according to the Automotive News Data Center in Detroit, lending early credence to 2019 forecasts. Scotibank Economics earlier this week predicted new-vehicle sales in Canada would total 1.93 million units in 2019 and 1.9 million in 2020, down from more than the two million sold in 2018 and record 2.04 million sold in 2017. Still, the January 2019 sales didn’t discourage the head of the Global Automakers of Canada, which represents Asian car companies here. Total passenger car sales in were down about 14 per cent while truck sales were down five per cent, according to Adams. The Ford F series truck was the country’s top-selling vehicle while the Honda Civic was Canada’s best-selling passenger car in January. Trucks continued to grow their share of the market last month, up to 75.1 per cent compared with 73.2 per cent of total sales in January 2018. At least two automakers — Hyundai and Toyota — are off to roaring sales starts, despite the 2019 forecasts and after a drop in both industry-wide December and annual sales to close out 2018. Nissan Canada’s total sales were down 10 per cent in January. The Nissan division sold 7,294 vehicles, down nine per cent over the same month last year. Luxury Infiniti sales fell 18 per cent to 673 units. One bright spot was the Nissan Qashqai compact crossover, which finished January with 1,213 units sold, an increase of 13.5 per cent from 2018. The Nissan Leaf all-electric vehicle had its best January ever with 247 units sold. But Sentra sales were down by nearly half to 521 units. Rogue, despite being the automaker’s top seller, saw its sales decline 24 per cent to 1,811 units. Ford Canada’s total sales slipped two per cent in January, down to 16,154 vehicles. Ford brand sales were down 1.8 per cent to 15,655 while Lincoln dropped 4.2 per cent to 499 units. The automaker didn’t immediately release month-over-month sales comparisons of individual nameplates. The F series truck continued to be the company’s best-selling vehicle at 8,554 units sold. Ford, which is exiting the car market all together, sold just 939 cars in January with the Fusion leading the way at 279. General Motors saw its sales drop 15 per cent, one month after a 30-per-cent decline in December. GM Canada will no longer provide brand or model breakdowns moving forward and is still considering a move to quarterly reporting, a spokeswoman told Automotive News Canada on Thursday. The company does intend to provide a breakdown of car and truck totals as well as a comparison of retail and fleet sales. Brand breakdown for General Motors in the Automotive News sale chart above are estimates. Toyota Canada total sales, including its luxury Lexus line, were up 14 per cent in January. Toyota brand car sales were up 21 per cent to 4,428 units while Toyota truck sales rose 14 per cent to 8,350. Yaris, Corolla and Camry sales all posted gains of more than 20 per cent. Corolla was the top-selling car by volume with 2,734 sold, up 24 per cent over last year. RAV4 continued to be the automaker’s top-selling vehicle with 3,630 sold, a 32-per-cent gain over last January. While Lexus car sales were off eight per cent, truck sales were up 16 per cent with the NX being the top-selling luxury vehicle for the automaker with 450 sold. The numbers lend credence to Toyota’s philosophy about the car market. "There are still people out there looking for passenger cars," Bill Fay, senior vice-president of automotive operations at Toyota Motor North America, told Automotive News in December. "And if there are less options out there in the market, I guess we figure, for now, that's good for us." Hyundai and Kia sales were up in January compared to the same month in 2018. Hyundai sales surged 22 per cent to 6,366 vehicles. The Elantra remained the automaker’s top-selling car at 1,899 sold while the Tucson was Hyundai’s best-selling truck at 1,366 units. The Kona wasn’t far behind with 1,211 sold. The automaker’s luxury brand, Genesis, sold 51 vehicles in January, up from 30 last year. “The momentum we generated in the second half of last year is simply continuing in 2019. Our year-over-year gains came from our North American Utility of the Year, Kona and Kona EV, as well as our top-selling volume model Elantra,” Hyundai Canada CEO Don Romano said in an email to Automotive News Canada. “The overall gains in Hyundai and Genesis sales were predominately from stronger retail business,” Romano said. Meanwhile, Kia sales were up nine per cent to 3,548 vehicles. The Forte was its best-selling car at 847 units while the Sorento was the top-selling truck at 812. FCA Canada sales plunged 20 per cent in January to 14,191 vehiclescompared to the same period last year. Ram was the only one of six brands to post a sales gain, up nine per cent over last year. Most of those gains were on the back of the Ram pickup, which saw a salesjump nine per cent to 5,496 units. The automaker’s Ram ProMaster Van line saw sales sink 19 per cent to 269 units. Jeep sales were off 35 per cent. The subcompact Compass posted a gain of 51 per cent to 816 units. Grand Cherokee sales were also up 13 per cent to 1,155 units. But those gains couldn’t offset huge losses elsewhere. Wrangler sales plunged 56 per cent to 1,639 units and Cherokee sales slumped 42 per cent to 1,003 sold. Chrysler sales were down 46 per cent with Pacifica sales off 47 per cent to just 277 sold. Dodge fell 27 per cent with the Durango — up 74 per cent to 700 units — and a 184-per-cent increase in Challeneger sales (270 units) as the only bright spots. Caravan sales were down 43 per cent and Journey sales dropped 39 per cent. Low-volume Fiat fell 14 per cent and luxury Alfa Romeo was down 59 per cent.